In a day that ended in 50 mile an hour winds and a torrential downpour, we stuck it out for all three races, taking second place in our class. Here’s a blow by blow account. White caps propelled by 15 knot winds roared down the water on both the Virginia side and the Maryland side in front of even stronger gusts. 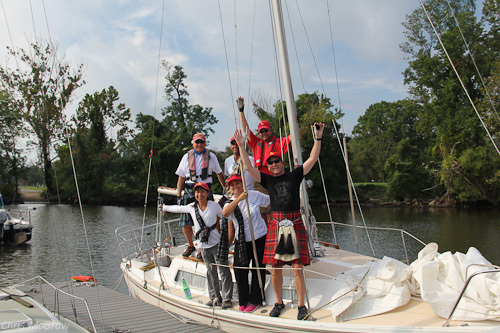 The high seas sent more than 3/4’s of the boats in our racing class back to the docks and to a safe port well before the three races were over—but not Team Tartan! We’re nuts, and we sail to win. (Details here: https://sites.google.com/site/disc2014/race-results/2012-race-results/leukemia-cup/non-spin-b). We braved the weather in our fearsome Scottish gear. Though we were sailing on our ear most of the time, and drenched by river spray all of the time, we rocketed past the competition to beat every single boat in our class—save one. 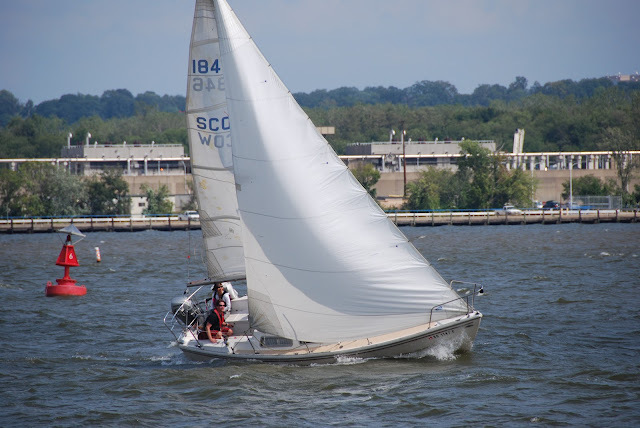 In the gusty conditions, we sailed at full tilt, recklessly sporting a 150 headsail. Commodore Chris was at the tiller and in calm and cool command, with Kyoko ventilating and angling the mainsail. Anna and Dad were the rail meat (and they have the purple posteriors to prove it). Their job was to lunge themselves over one side or the other to keep the boat’s feet under us without falling into the drink. Gary and Deepak pulled the headsail with hundreds of foot-pounds of pressure on it through furious and relentless tacks. At one point in race two, Deepak splashed into the water with a rogue wave, pulling himself back over the gunnel with super human strength and returning to his crank. In the end, we somehow kept the entire crew on board, though we did see one of our cranks slip the surly bonds of the deck and sink into the silver spray. We fought the conditions tooth and nail and battled to the front of the pack in each of the three races. 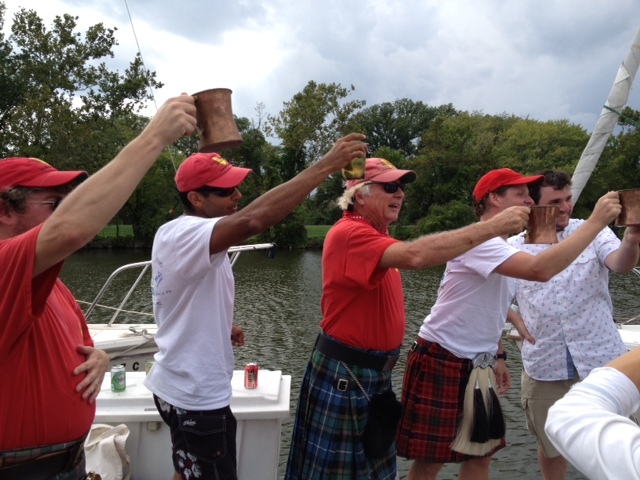 After the second race, the weary crew petitioned for relief to no avail. Commodore Chris urged us on to complete a spectacularly strategized set of races. Meanwhile back on land, Faith and Chris V held down the fort, cheered us on, and hoisted a mug or two. We won a second place on the water and ended up bruised and battered, feeling the race in our bones even two days later. What a day, and what a regatta! 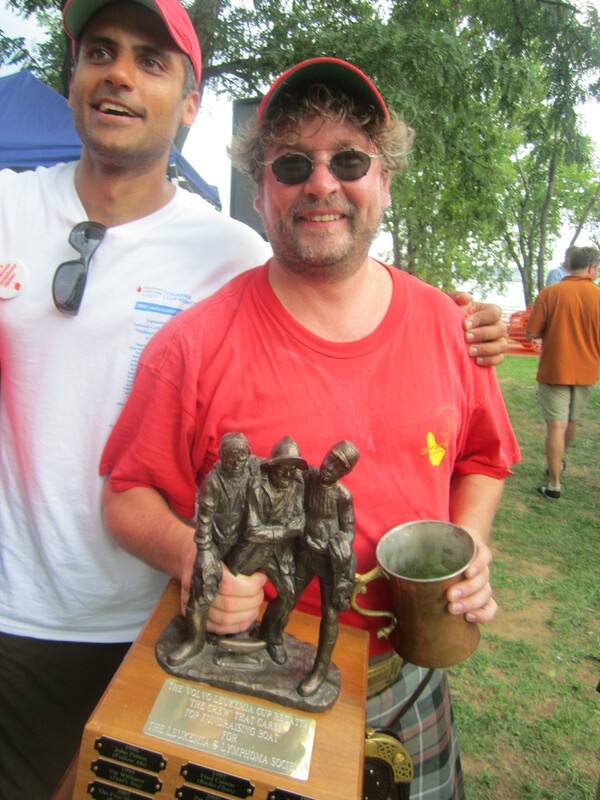 Though we took a hard fought second in the regatta (besting our arch nemesis Captain Bill, but falling to a much bigger vessel), we took first in fundraising. 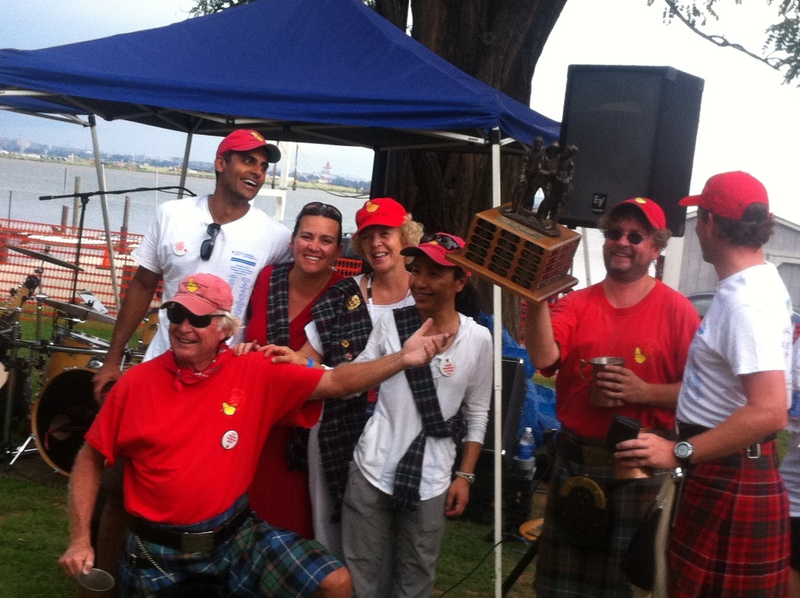 Thanks to YOU, Team Tartan won the major award of the regatta as the highest fundraising boat! Together, 89 of us raised an incredible $20,355 to fight leukemia. 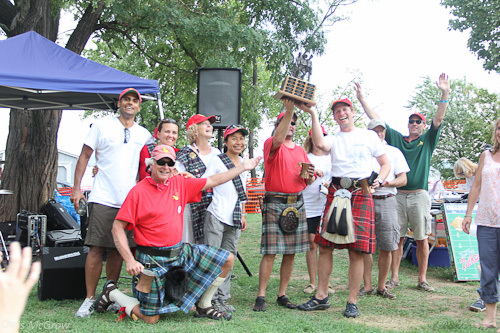 (Once again a special Team Tartan thank you to Phil Venables for his $10,000 donation.) We can’t thank you all enough. You rule. Next year we intend to win both!